Consumers often lack information about fuel economy when purchasing vehicles. Researchers provided fuel economy information to potential car buyers in both dealership and online settings to measure its impact on purchasing behavior. In both experiments, researchers found no effect of the information interventions on the vehicles that consumers bought. Consumers often lack information about the true costs and benefits of products they purchase. This is particularly relevant when buying cars, since lack of information or inattention to details might inhibit consumers from buying higher-fuel economy cars that could save them money in the long run. This increased energy use could also exacerbate negative environmental impacts. If consumers are poorly informed about fuel costs or do not pay attention to fuel economy, then providing them with information might cause people to buy higher-fuel economy vehicles. This study took place in two different contexts. The first was among prospective car buyers at seven Ford dealerships across the United States. The second was among users of the online platform ResearchNow, a market research panel that pays members a small incentive to complete surveys. The sample consisted of American adults who reported they were intending to purchase a car within the next six months. iPad app displaying fuel costs of cars customer was considering in the dealership experiment. Researchers partnered with ideas42, a behavioral economics think tank and consultancy, to test the impact of providing information on fuel costs on consumers’ car purchases. They did so via two experiments. The first provided fuel economy information to consumers via in-person intercepts at the seven Ford dealerships nationwide. The second provided similar information to consumers via ResearchNow. A description of how fuel economy improvements reduce fuel costs the most among vehicles with the lowest fuel efficiency. Information on the estimated annual and lifetime fuel costs for the vehicles that the customer was considering purchasing, put in perspective using other purchases such as clothing and travel. 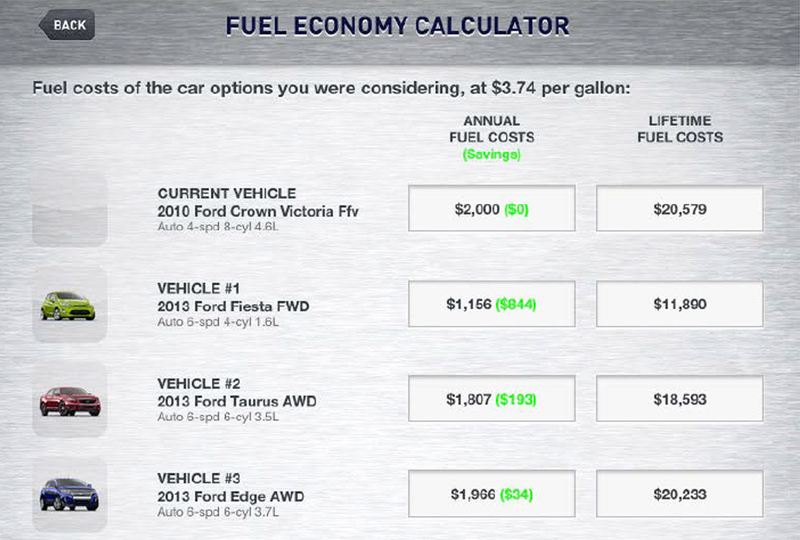 Information on the estimated annual and lifetime fuel costs of different submodels of each vehicle that the customer was considering purchasing. Customers participated in initial surveys at the dealership between December 2012 and April 2014. Researchers conducted phone surveys several months later to determine what car the consumer ultimately purchased. Using ResearchNow, researchers also surveyed participants about their annual fuel cost estimates for each vehicle they were considering purchasing. The intervention provided similar information to that in the dealership experiment, with some randomly selected participants receiving additional information on estimated fuel savings compared to the national average, estimated social damages from vehicles’ carbon emissions, or both. Platform members participated in the online survey and received the information intervention in March 2015. Researchers conducted follow-up surveys to determine what car the consumer had purchased in two rounds, from July to November 2015 and from August to September 2016. In both the dealership and online experiments, researchers found no effect of the information interventions on the average fuel intensity of the vehicles that consumers bought. Stated Preferences: Providing fuel cost information caused a small increase in consumers’ stated preferences toward higher-fuel economy vehicles, but the information also caused consumers to decrease the importance they reported placing on fuel economy, in general. In the online experiment, the treatment group rated fuel economy 0.56 points less important on a scale of 1 to 10, from a base of 7.68, and was willing to pay US$92 and US$238 less for 5 and 15 miles-per-gallon fuel economy improvements, respectively. One possible explanation for this is that people initially overestimated fuel costs, so providing them cost information decreased the importance of fuel economy. Purchasing Behavior: Providing information caused no change in the average fuel economy of vehicles consumers ultimately purchased. For the online test, there was additionally no effect on consumer types that one might expect to be more influenced by information: those who were less certain about what vehicle they wanted, had spent less time researching, were considering cars with more widely varying fuel economies, or made their purchase sooner after receiving the intervention. Consumers may not have changed their preferences or purchases because they either did not remember the information or did not find it useful. It is also possible that lack of information was not the cause of consumers’ purchasing behavior, in which case some unidentified factor in the car market may have influenced the observed purchasing trends. Allcott, Hunt, and Christopher Knittel. "Are Consumers Poorly-Informed about Fuel Economy? Evidence from Two Experiments." American Economic Journal: Economic Policy 2019 11 (1): 1–37. 1Greene, David. 2010. “How Consumers Value Fuel Economy: A Literature Review.” US Environmental Protection Agency Technical Report EPA-420-R-10-008. Washington, DC.